There are some drawbacks to approaching work from a playful perspective when you’re multi-tasking. 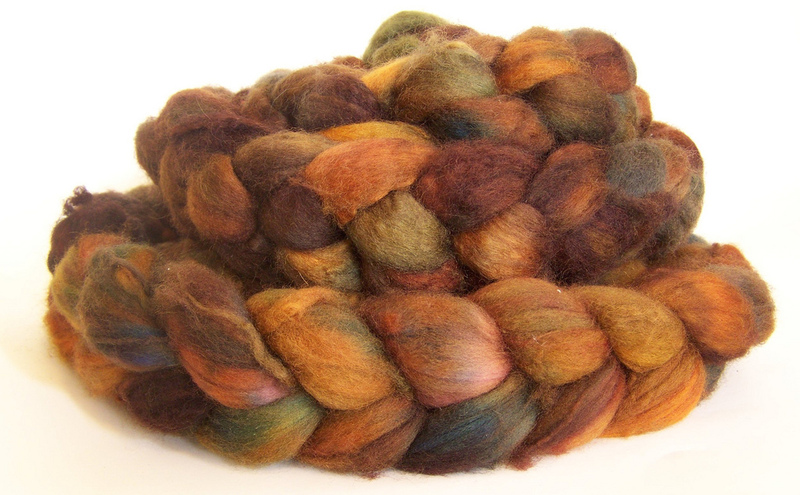 In dyeing, largely it’s the spontaneous, non-repeatable colorways that result from a sprinkle of this and a dash of that. Despite my best attempt at noting application technique, quantity, and time I often cannot duplicate colorways. Then there are the mistakes. I once left a half pound each of superwash BFL and Merino in the crockpot overnight. Why I didn’t remember before I fell asleep, I do not know. When I woke up the next morning, I sat up and immediately remembered that I left the crock pot going. The crock pot was bubbling away and my basement studio smelled like cooking hair. Not quite burned but definitely well done. Which is what I called the fiber. As it was superwash, it had not felted so I decided to salvage it for my own personal use. A whole pound of unsellable fiber? Boo. A whole pound of fiber just for me? YAY! I’m planning on carding them together with a bit of bronze angelina. Which leads me to my current large spinning project. 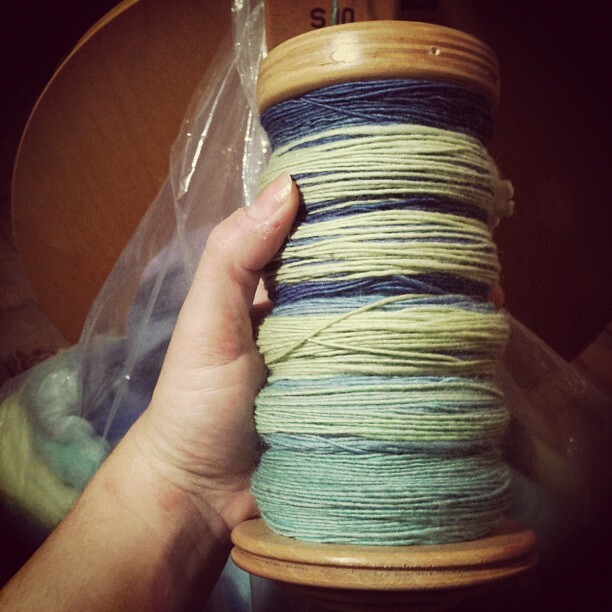 The first batch of fiber I dyed up for the October Long on Color fiber club bled. It bled and bled and bled. I must have forgotten to add acid to that dye because the subsequent batches from new dye stock were totally fine. 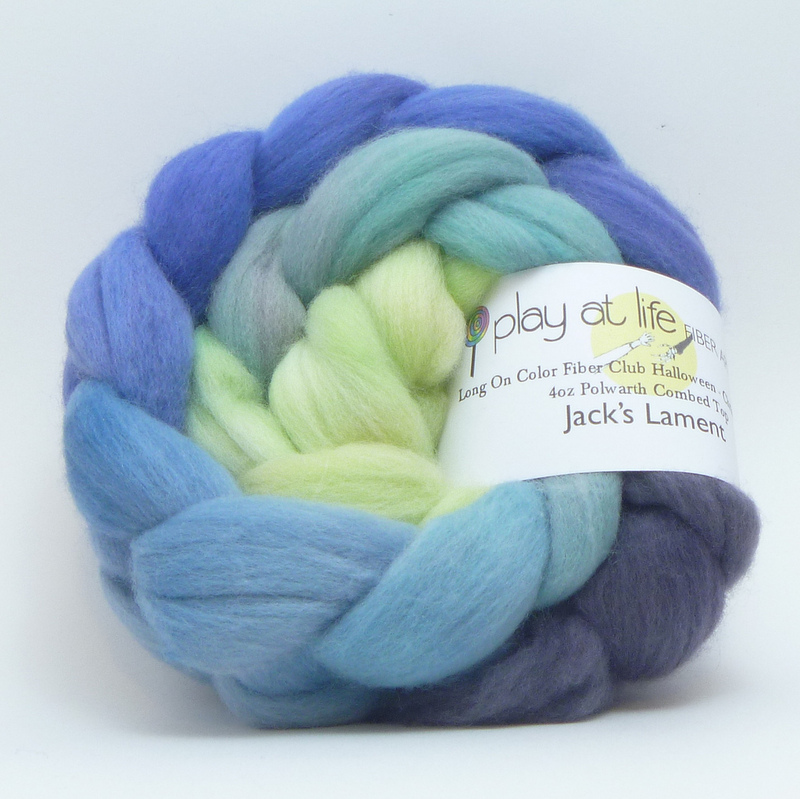 This left me with one 4oz test braid and four 4oz braids that were fine to spin but weren’t good enough for the club. Boo. But now I have 20oz of Polwarth in this lovely colorway! YAY! One bobbin down, 2 more to go! This entry was posted in Spinning by cgovernoillustration. Bookmark the permalink.